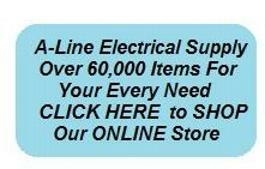 Stocked in our large warehouse you will find thousands of electrical items from hundreds of manufacturers. We service industrial electrical contractors, institutions, as well as wholesale suppliers to many other businesses. We provide everything from wire, cable, pipe, service equipment, panelboards, switchboards, standby power systems, structured home wiring, intercoms, tools, lighting fixtures, surveillance cameras and everything in between. Call us for quick delivery. All major credit cards accepted.